Our son Jonah was born on May 6, 2005. He was born with his eyes wide open, taking in everything around him. His energy, curiosity, and strong personality were evident from his first moments of life. His labor and delivery took less than 6 hours – he was in a rush to get here – and he has been running ever since. On his 12th day of life, a Wednesday, he was a bit fussy and we knew something was wrong. We paged his pediatrician who chalked his behavior (and ours) up to a colicky baby and first time parents. We continued to feel something was wrong, but being unsure, we waited. We had his two week check up in less than two days, so we figured wait and see. The checkup was before noon that Friday. We were rushed to Children’s Memorial Hospital in Chicago. Jonah’s heart rate was over 320 (a normal person’s is usually about 120-140). They estimated that he had been that way for at least two days (since the night we had called). Then the words – HEART FAILURE. 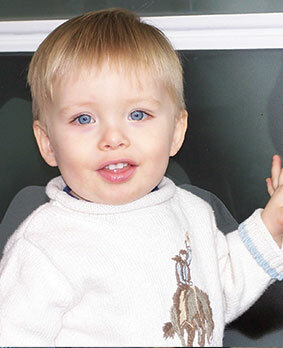 Jonah had been in Supraventricular Tachycardia (SVT) for over two days. When your heart beats that fast, it can’t pump blood to the rest of your body. His little heart had failed. His liver was enlarged. He started to turn blue. To make matters worse, he had a complicating arrhythmia called Wolff Parkinson White, which made the SVT more deadly. He also had some structural abnormalities – a hole in his heart and some other things. They covered his face in ice – he yelled – and they broke the SVT – for some reason, ice to the forehead can break an SVT attack in some people. However, the SVT reoccurred as we waited in the Emergency Room. We ended up spending a difficult week at Children’s, with Jonah going through lots of tests, closed veins that required IV teams, and lots of probing hands. It was two days in the PICU and the rest on the 5th floor. Needless to say, the nursing care was outstanding and the doctors brilliant. They saved our son’s life. We were sent home with medication, a stethoscope, and lots of information. We were told that many, many children live perfectly normal lives with WPW/SVT – there’s even a famous basketball player that had it. However, before we could even think about that, we had to make it through his first year – especially the first 6 months which were considered the most dangerous. Thanks to the care he received, amazing breakthroughs in pediatric cardiology, and a healthy dose of luck, Jonah has not had any more SVT attacks. Today, he is, for all intents and purposes, a normal, rambunctious toddler. We could face the possibility of surgery when he’s older to correct his arrhythmia, and the future isn’t guaranteed, but the doctors are very optimistic. Today we are happy and enjoying our son. We will cross whatever bridges that lie ahead with the same grace and strength that he has shown through this entire ordeal. We are grateful for the incredible care we received at Children’s Memorial, for the doctors and nurses, and all the researchers that helped get Pediatric Cardiology where it is today. Because of their efforts, we get to watch our son play trains, enjoy falling leaves, learn how to talk, and most importantly, run bravely into the future.